Search Bars! Search Boxes! What the heck are those and why on earth would I want one on my blog?! Aww friend, I am SO glad you asked! Let me tell you all about this fun lil thing. Search Bars/Boxes- What are they? Simply put, a search box/bar works the same as any other search engine would (Ahem...Google, anyone?) except it's on YOUR BLOG and searches through YOUR STUFF! Wheeeeeeeeee! We like that. For any Blogger users out there, this is in the form of a "Gadget", and is something we can SIMPLY add to our blog to give it a bit more blinggy-bling. Why Should I Have One on My Blog? Well, there's a couple of reasons! For one, functionality! This little Gadget-O-Love adds a lot of functionality to your blog. It enables readers to search through all of your hard work and find exactly what they are looking for. Why is that important? Because if any readers out there are ANYTHING like me, they don't have a lot of time to scroll through each and every post you've ever written until they find what they're looking for. They'll most likely give up along the way and go somewhere else (GASP!) to get their info. We definitely don't want that. So, by adding a Search Bar/Box you are saying to your devoted readers, "Hey, I get it...time is money. Why not type in exactly what you're looking for and be on your merry way?" That's exactly what it does. 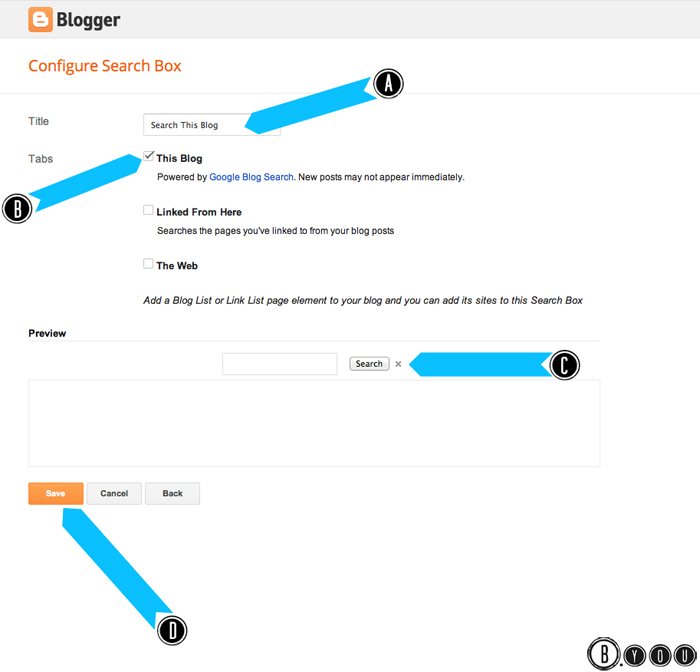 It creates a little internal search engine within your blog! So now, anytime you've tagged a post (I hope you're making precise tags within each blog post you publish) those tags get stored in your search engine. So let's say Sally loves your blog, is trying to do something she knows she's seen posted before, but can't remember when. By having a Search Bar/Box all she needs to do is kind of know what it is she's looking for (maybe..."fun fonts for free"), type those words into your bar, and hit enter. Your internal search engine will now do the work for her! It will search through each and every post you've written, and then bring up a nice little tidy list of previous blog posts that has something to do with her key words! So instead of 700 posts, she now only has to go through a couple. Usually the search engine is so smart and precise, that it narrows it down to only 3-4. Badda Bing, Badda Boom. 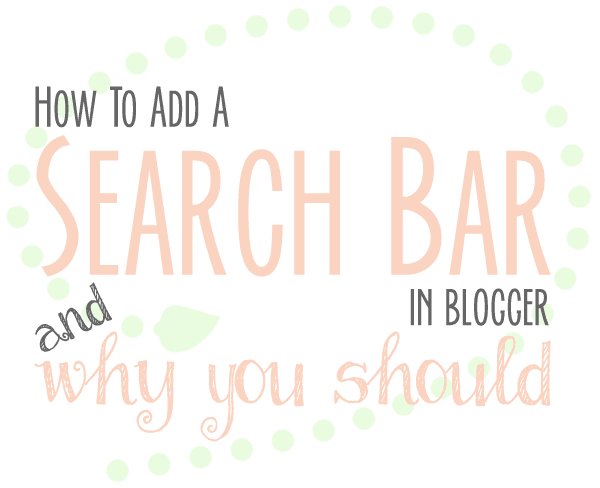 In essence, a Search Bar/Box makes your blog work the way it should, as well as making it engaging and helpful. This keeps your readers coming back time and again. So now, How Do I Add One to My Blogger Blog? 1. First and foremost, make sure you are signed into your Blogger account. 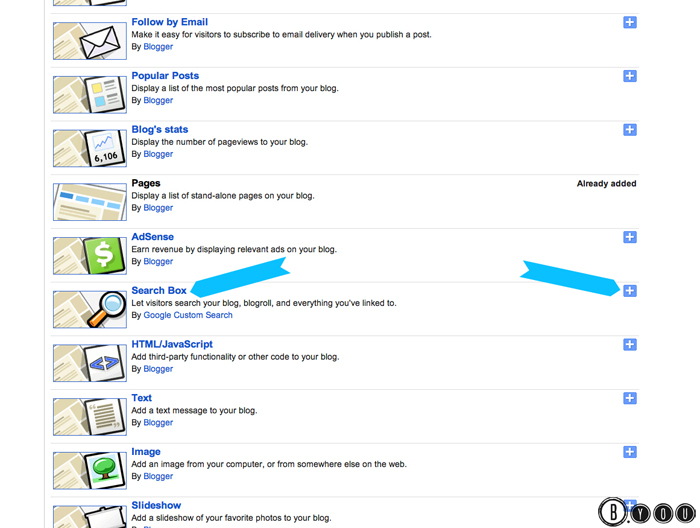 Once you are, you're going to go to your blog's homepage and click "Design"- which is up on the top right! 2. By clicking "Design" you are able to see your blog's inner core- where you can do any and all changes you might want to make. There are so many lovely things you can do in this place, so play around! For our purposes we will need to find "Layout" and click it. 3. 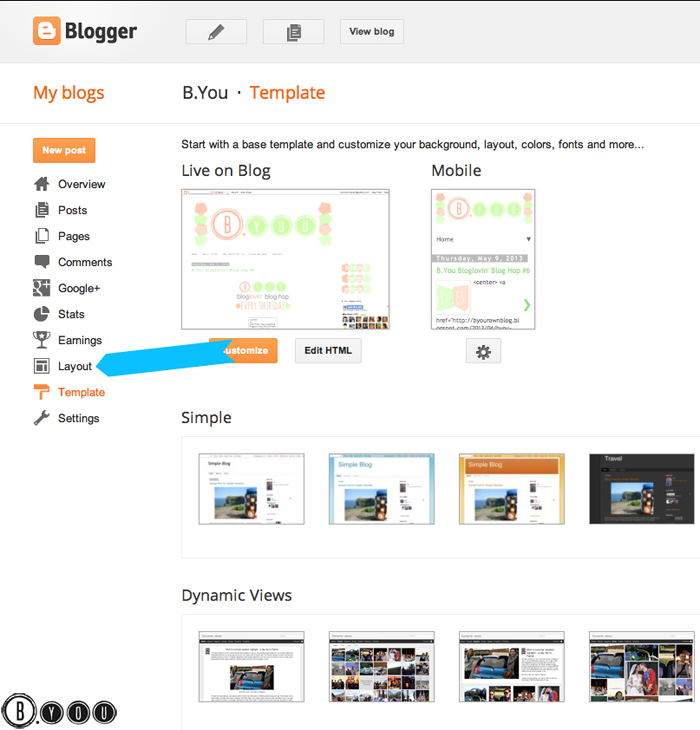 Next, you'll see you're now able to see your blog's "skeleton" (in a sense). This is an outline of what you have on your blog, where everything you've added is placed, and an easy way to make any changes- like moving something around, deleting something, or adding on. Find where you want to add your new Gadget (a Search Bar/Box is indeed a Gadget! )- this place doesn't have to be exact- but has to be around where you're thinking of having it go. I suggest having a search bar somewhere close to your main information on your home page (i.e. : profile pic, social media, etc). We can move the Search Bar around once it's installed. 4. Now we are seeing a list of all the different Gadgets available on Blogger! There's some neat ones there, so look around! You might find something you didn't even know you could do! As you can see, Blogger lets you know what's already been installed by simply saying "Already Added" on the right side of each Gadget. Scroll down until you find, "Search Box" and click the little "+" on the right. This adds it to your blog! 5. Now we need to simply configure our Search Bar/Box. All this means is we're going to make it do exactly what we want it to do. A. Here you can title whatever you want your bar to be. Keep in mind that this "name" will show up on your blog for all to see. You can also leave it blank should you choose. B. Make sure this box is checked! This allows people to type in key words (i.e. 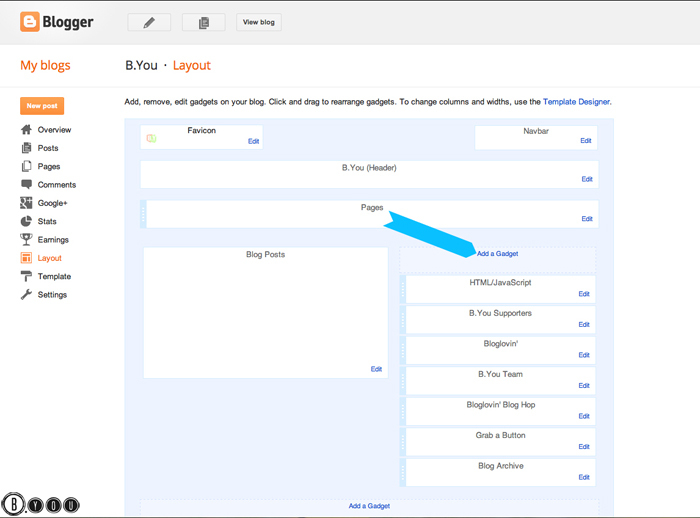 : How To, Blog Design, Blog Help...) and your Search Bar will search ALL throughout your blog's posts for any post related to those words! Neat huh? D. When you are satisfied, click "Save". This will apply those changes to your Search Bar/Box. 6. 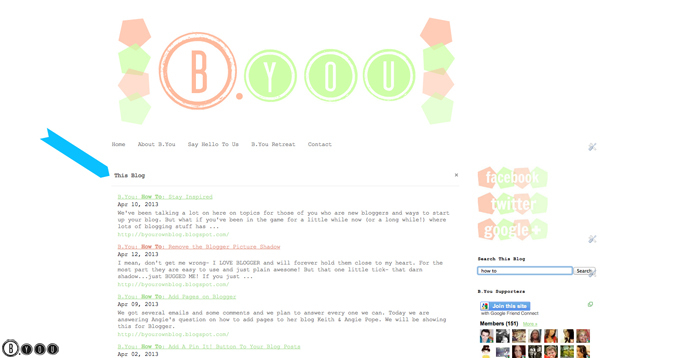 Now as you can see we're taken back to our blog's skeleton. And, as you can see in A. our Search Bar is automatically up at the very top of my Gadget list. I'm not happy with it being there, so to move the box around all I need to do is click and hold down on the box, and drag to where I want it (within that area). Usually just up and down. If you're wanting it somewhere completely different, you'll need to delete (by clicking "Edit"), delete the Gadget, and start over someplace else on your skeleton. B. When you think you know where you want it, click "Preview" to be shown a mock-up of what your blog will look like once you hit "Save". Click out of that box and come back here to make changes. I usually have to "Preview" 3 or 4 times before I've got it right. C. Again, once you're happy with your placement, click "Save Arrangement"! 7. Viola! When I go to my homepage, displayed in all it's glory is my new Search Bar/Box! It's easy to see (up towards the top) and is titled appropriately (so my readers know what it is). 8. Here's how it works! Let's say you want to find an old blog post, or your reader really needs to know how to do something: Just type in the key words into your Search Box and BOOM a beautiful list of ANY and ALL YOUR BLOG POSTS that include those words, shows up! Neat. Tidy. Easy. That's what we like! SO helpful! 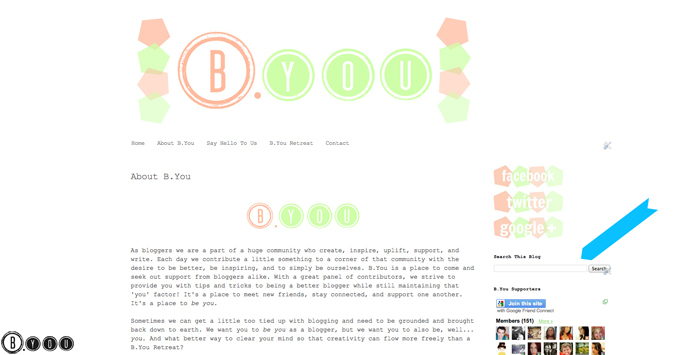 I wish this had been available when I was starting my blog - you're amazing, friend! Awww hehehe, an old pro like you?!?? I'm sure you had no problem at all figuring out what you needed to do. Your blog is one of my favorites!